When preparing to tie the knot, it can be easy to get caught up in the excitement and overlook important discussions about things that will affect you for the rest of your lives. 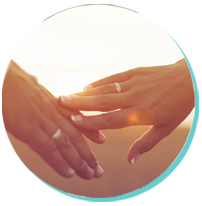 Many times, couples get engaged but they are aware that they already have issues that would be better off resolved before walking down the aisle. Give yourself the best possible chance for a happy future together by attending premarital counseling. Who better to do this with than a marriage counselor! Learn what it means to have a secure functioning relationship, if you have one already, and if not, how to create one. You love each other so much…set your relationship up to be one that will last for decades. Premarital counseling is often shorter that traditional couples counseling. If you have not been together so long that you have loads of history and issues to untangle, then we may simply cover the bases and make sure that you have looked at and discussed important topics. I use an online questionnaire called Prepare-Enrich that generates a thorough report of your relationship strengths and growth areas. This allows us to get a fast bird’s eye view of the areas we need to address in your premarital counseling. I am often asked how long premarital counseling takes. Each couple is different, and my approach is personalized. But some couples complete the work they want to do in as few as 4 sessions. Others may do 6-8. A small number have deeper issues to address and may choose to continue with counseling to strengthen their relationship even after their wedding.